I'm Mindy. I live with my two kids, my husband and a constantly open door and table. I sing all the wrong lyrics to songs. I love to read old books, eat anything my husband makes and paint with my girls. I cheer loudly in football season. I love talking to preschoolers and grandmas. I let a lot of loose ends drag. My crazy life tends to make my mom and my sister laugh. I believe that God wants us to live life with joy and grace. Grace to ourselves in our flaws. Grace to others in all things. Joy overflowing in giggles and grins and fun on our good days. Quirky Faith means being unexpected and cheerful and seeing God show up in daily ordinary things. Faith takes boring and makes it inspiring. I'm here to remind you that Jesus sees you with love. The walk with Him can be surprising. Sometimes it's hilarious. Join in and see.  Quirky Faith is a participant in the Amazon Services LLC Associates Program, an affiliate advertising program designed to provide a means for sites to earn advertising fees by advertising and linking to www.amazon.com.